A commercial line of light chasers. SC804 may chase from 2 to 8 separate circuits of 4 amps each. SC408 ( SC404 ) may chase 2 to 4 circuits of 8 amps ( 4 Amps ) each . 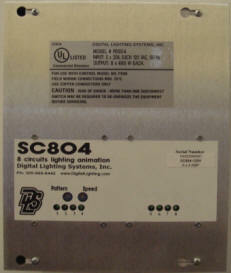 SC216 can flash 2 circuits of 16 amps and may also be expanded with a booster. The SC-Series "SUPER-CHASERS" are PD804,PD408,PD216 & PD404 units with self controlled software. They are used for creating eye grabbing light animation. Whether you need a simple marquee chaser or need an intricate animation sequence for a special display, you are likely to find it among its 14 built-in patterns. Select the pattern, set the speed and let it do the rest. You want more "Dazzle", put it in automatic mode and let it scroll through all of its patterns automatically. The constantly changing patterns will turn your lighting display into a fascinating show. The SC-Series are multi-circuit chasers, suitable for controlling incandescent, low-voltage, LED and neon displays. They are ideal for applications requiring sophisticated lighting animation at an affordable price. The SC-Series use the latest solid-state components. This makes them very reliable and trouble free controllers. Their modular design makes them simple to install, operate, and maintain. Easy, reliable, inexpensive and no maintenance replacement for old electro mechanical flashers in signs, marquee animation and other lighting applications. Use to replace mechanical lighting chasers. Active Inductive Load Protection From DC Power Components. Suitable For Low-Voltage and Neon Loads. Custom Patterns & Modifications Available. Master / Slave Configuration For Bigger Loads. Wall-Mount 11.75" H x 8.30" W x 4.12" D Aluminum Enclosure. 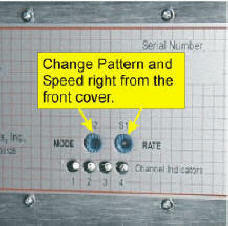 Single-Phase, 120 VAC- 50/ 60 Hz Operation. Available in 12, 24, 120 and 220 VAC Models. Can Drive Up to Five 4 x 8 A. SL408 Slaves for Increased Output Capacity.